Written by CMOS Bulletin SCMO on January 26, 2019 . Posted in Arctic, Oceans, What's Current. The authors start by discussing sea ice physics and the related numerical modelling techniques needed to produce forecasts, like the ones produced for weather by large-scale operational models. The chapter concludes with a list of recent and future important developments related to sea ice models. The next chapter, on sea ice observations, starts with an introduction to satellite remote sensing and the interaction between electromagnetic radiation and the surface. After comparing passive and active remote sensing, the authors discuss the approach and instruments most commonly used for the observation of sea ice parameters. Chapter 4 introduces the concept of data assimilation, used to correct the background state by including useful information such as satellite observations, to produce a short-term forecast. Data assimilation techniques such as Kalman filtering, variational analysis, and ensembles, are described in a clear and precise manner. The next chapter describes different automatic prediction systems that are currently under active development in national ice services. These include the Regional Ice Prediction System (RIPS), the Global Ice-Ocean Prediction System (GIOPS) and the Canadian Seasonal to Inter-annual Prediction System (CanSIPS), all three from Environment and Climate Change Canada. 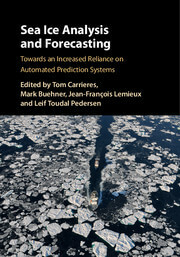 The authors then discuss a fundamental step in the development and application of an automatic forecasting system: the validation of the system or measurement of forecast quality. The last chapter speculates on how national ice information services could evolve and the benefits they could soon reap with the advent of automatic prediction systems. Students, ice forecasters and analysts, researchers, policy makers and specialists working in this field and in the national services will find this book useful. *Note: For all “What’s New” articles, the policy of the CMOS Bulletin is to print the article in the language (English or French) in which it was written, providing a summary in the alternate language.